In June, the last CBD pub that didn’t have heritage protection, the 1925 Metropolitan Hotel on the corner of William Street and Little Lonsdale, became the latest place threatened by the little known ‘80m on corners’ rule. A development proposal would see just the external walls retained, and a 27 storey ‘as of right’ tower above, perched on legs through the roof. This has fortunately been put on hold while the City of Melbourne moves to heritage-list the site as one of the few pubs left in the CBD, though this may not prevent something like it going ahead. Listed buildings in the CBD and South Carlton have been allowed to have towers-on-legs above retained facades despite the obviously poor heritage outcomes. The Elms Family Hotel on Spring Street and the former Bank of Australasia on the Haymarket are two examples currently under construction. A worse version, without legs, is happening to the (non-heritage listed) gold-rush era Great Western Hotel on King Street, where the facades will be stuck the base of a 27 storey tower, allowed thanks to the 80m rule. The Great Western and the Metropolitan have come under this kind of pressure because of a clause first mooted in April 2016 as part of new rules about how much you can build on any one site. These rules included a mandatory setback of 5m from any street or lane above a pedestrian-scaled podium of 20 to 40m (5 to 10 storeys), EXCEPT if it was on a corner, in which case you could go up to 80m (27 floors). This clause means corner sites are more valuable, and sure enough both hotels were sold in mid 2016 at higher than expected yields. The reasons for this peculiar situation, which will mean a pedestrian scale for one site and a sheer tower next door, were never fully explained, and its clear it particularly affects historic buildings. 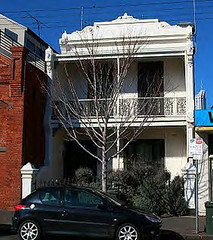 Other corners in the CBD that are now under more pressure include a number of ex pubs, such as the 1872 Alexandra Hotel on the Russell and Little Lonsdale, which was only sold this month. The 1913 Kilkenny Inn on King and Lonsdale, has been rumoured to be for sale for some time, and the Art Nouveau Charles Hotham Hotel on Spencer Street was sold a year ago. 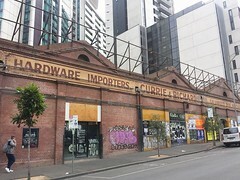 Other buildings are at risk, such as the 1923 bank, now a hotel, on the corner of Collins and Spencer, the 1869 shops on the corner of Queen and Little Bourke, and currently unlisted places like the 1913 warehouse on King Street cnr of Little Bourke. MHA believes that this 80m-corners rule was a mistake that should be rectified, but this seems unlikely. In the meantime, we can only hope that improved heritage rules, under way at the moment, will prevent the kind of terrible compromises created by pitting heritage against high development potential. ← Castlemaine Brewery Southbank – add your voice !